Interfacial science has rapidly expanded beyond the original realm of chemistry to include specialized subfields. This book covers an exapnding body of work dealing with the dynamics and thermodynamics of molecular systems in spatial confinement. Participants from various disciplines share their views on how ultrasmall geometries can force a system to behave in ways significantly different than its behavior in bulk, how this difference affects molecular properties, and how it is probed. Investigators are studying phenomena in a broad range of materials, and confinement of liquids is also an important issue. 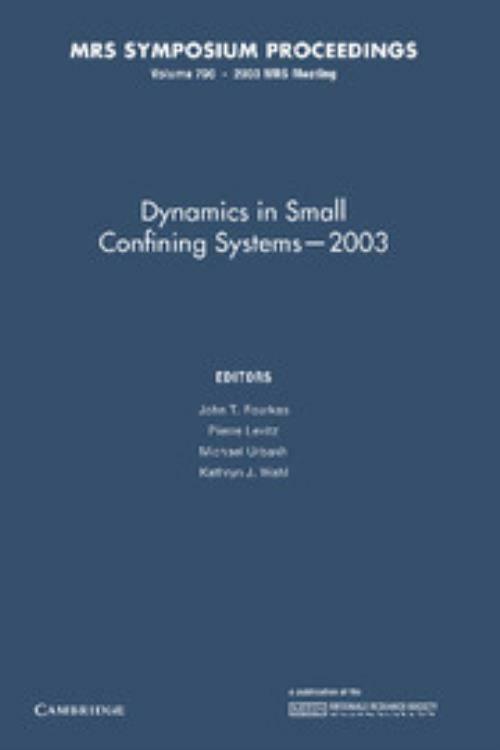 Advances in experiment, theory, and computation have greatly increased our understanding of dynamics in confined systems, but this book proves that there is still much to be learned. Topics include: confined and anomalous dynamics in porous, supramolecular and biological systems; methods to probe dynamics in confinement; microfluidics and hydrodynamics near solid surfaces; friction and structural properties of fluids under shear; dynamic force spectroscopy; and numerical modeling and computational techniques of confined systems. John T. Fourkas Boston College, Massachusetts.